Download Ubuntu Linux 12.04.3 LTS. Download Hadoop 1.2.1, released August 2013. Once the Linux server is set-up, install openssh, by executing the following command. There are certain required steps to be done before starting the Hadoop Installation. They are listed as below. Each step is further described below with screenshots and commands for additional understanding. Before proceeding, make sure the Linux box is updated with the latest set of packages from all repositories and PPA’s. It can be updated by executing the following command. Download the latest Oracle Java for Linux from the Oracle website by executing the following command. In the event, the download fails, try executing the below command which bypasses the username and password. Copy the downloaded Java binaries to the folder /usr/local/java, by executing the following command. Unzip the downloaded Java file by executing the following commands. This unzips the java binaries in the folder /usr/local/java. Add the following system variuables to the path by editing the system Path file located in /etc/profile. Execute the following command to indicate where Oracle Java JDK/JRE is located. This will tell the system that the new Oracle Java version is available for use. sudo update-alternatives --install "/usr/bin/javac" "javac" "/usr/local/java/jdk1.7.0_40/bin/javac"
Check the java version, to find out if java was installed successfully. While it is not required, it is generally recommended to create a separate user account to run the Hadoop installation. Start by adding a group by executing the following command. Create a user (hduser) and add it to the group (hadoop) created above. You will be asked to provide the password and other information. Hadoop requires SSH access to manage its nodes, i.e. remote machines and your local machine if you want to use Hadoop on it. This access allows master node to login to it’s slave nodes and to start and stop the services on them. For single node setup of Hadoop (as in this tutorial), we need to configure SSH access to localhost for the hduser user we created in the step above. 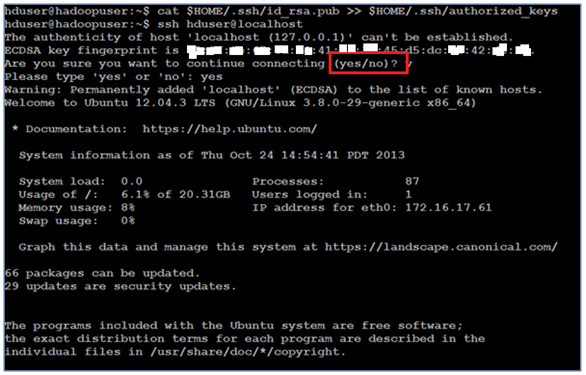 Make sure that SSH is up and running on the Linux box, and configured to allow SSH public key authentication. Login to the Linux box as ‘hduser’. 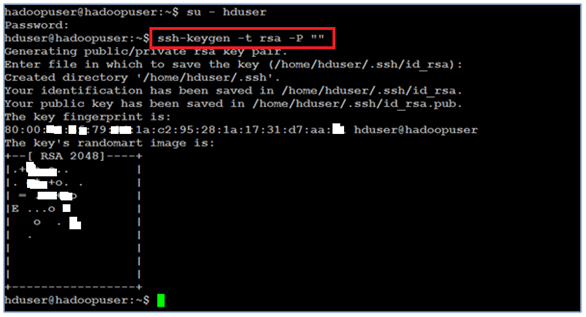 Generate SSH key for user hduser, by executing the following command. You will be asked the location where you would like to save the key file. Just click <Enter> to go with the default. The RSA key will be generated at ‘/home/hduser/.ssh’. This key generated with an empty password. Generally, it is not a good practice to have empty passwords, but in this case we need that there should not be any manual intervention when Hadoop is interacting with its nodes. Enable SSH Access to your local machine with this newly created key, by executing the following command. Last step is to test the ssh setup by connecting your local machine with the hduser user. This will add your machine’s host key fingerprint to the hduser user’s known_hosts file. One problem with IPv6 on Ubuntu is that using 0.0.0.0 for the various networking-related Hadoop configuration options will result in Hadoop binding to the IPv6 addresses of the Ubuntu box. Log in as the root. Open the file /etc /sysctl.conf by executing the following command. Add the following lines to the end of the file and reboot the machine, to update the configurations correctly. Download the latest Hadoop version. In our case it is Hadoop 1.2.1. 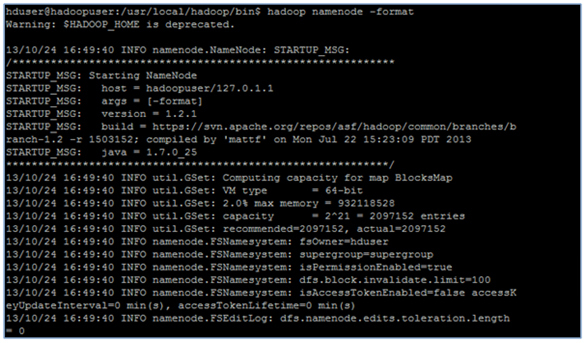 Rename the hadoop-1.2.1 directory to hadoop by executing the following command. Move hadoop directory and its contents to the location of your choice. In our case it is /usr/local. Change the ownership of the files to user hduser and group hadoop. There are certain files that need to be updated and certain configuration steps to be completed, before Hadoop is up and running. The configurations to be done are listed below. Each step is further described below with screenshots and commands for additional understanding. Execute the following command to edit the .bashrc file. Reload the .bashrc file by executing the following command. The only required environment variable we have to configure for Hadoop in this guide is JAVA_HOME. Open conf/hadoop-env.sh in the editor of your choice (if you used the installation path in this tutorial, the full path is /usr/local/hadoop/conf/hadoop-env.sh) and set the JAVA_HOME environment variable to the Sun JDK/JRE 7 directory. In this section, we will configure the directory where Hadoop stores its data files, the network ports it listens to etc. Login as a non hadoop user. Create a directory called data, by executing the following command. Change the ownership of this folder to user hduser. Create a directory tmp under the data directory. Add the following entry to the file. Save and quit the file. <description>The name of the default file system. A URI whose scheme and authority determine the FileSystem implementation. Add the following entry to the file and save and quit the file. then jobs are run in-process as a single map and reduce task. when the file is created. The default is used if replication is not specified in create time. Run netstat –plten | grep java to see list of ports running.